In this post, you will find the list of all the Nintendo 3DS Themes released during Week 6, 2019 in Europe, Japan, and North America! Unfortunately, no new Nintendo 3DS Themes were released this week in Europe. 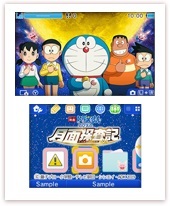 This week, only one new Nintendo 3DS Theme was released in Japan, and it’s another one for Doraemon! * this Nintendo 3DS Theme is only available until February 5th, 2020. It will be removed from the Nintendo 3DS Theme Shop after that date, most likely due to FuRyu’s licence expiring.